Print and electronic news media have played a central role in environmental politics for 30 years: negotiating access, shaping meanings, circulating symbols. Environmentalists have responded with strategies and tactics created for and communicated through the news media. Protest action is one such strategy that has become ‘reflexively conditioned’ to an unprecedented level in its pursuit of media attention (Cottle, 2008: 853). It is for this reason that the internet and the worldwide web have been a tantalising source of hope for activists over the past decade, offering the potential for independent information distribution devoid of the mediating effect of news journalists and the established news media industries. 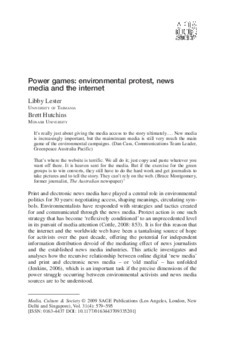 This article investigates and analyses how the recursive relationship between online digital ‘new media’ and print and electronic news media – or ‘old media’ – has unfolded (Jenkins, 2006), which is an important task if the precise dimensions of the power struggle occurring between environmental activists and news media sources are to be understood.